Phoenix Arizona’s climate is characterized by low to medium moisture during the wet months and hot dry summers. This type of climate can make it difficult for homeowners to know and choose proper plants for their Phoenix Arizona landscape. Generally you will want a healthy combination of shade trees, flowery shrubs, ground cover and accent pieces. The following are suggestions from each of these categories to enhance and improve your Phoenix Arizona landscape. Trees provide the greatest benefits in your Phoenix landscape and will be the largest plants as well. 1. Blue Palo Verde – This tree is native to Phoenix and produces beautiful yellow blossoms in the spring. The Blue Palo Verde tree generally grows to be 25’ tall with a canopy spread of 25’ making it an excellent choice to provide shade for shrubbery and ground covers as well as your dwelling itself which will assist in a reduction in energy bills. The Blue Palo Verde should be planted in an area that receives full or reflected sunlight with soil that has good drainage. In order to develop a “walk under” canopy, this tree will require substantial pruning in the early stages. Prune only in warm weather as cold weather pruning can cause the branches to die back which may bring on infection. Young trees should be watered weekly in the summer and monthly during the winter. Once substantial growth is established, Blue Palo Verde trees survive on low amounts of moisture. Water your established Blue Palo Verde only during periods of extended dry weather. To increase growth rate and canopy density, Supplemental irrigation is suggested. 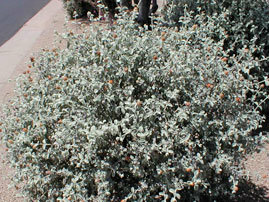 Shrubs give form and substance to your Phoenix Arizona landscape. They can hide unsightly areas, and divide large areas into smaller ones. 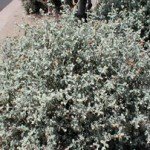 The following recommended shrub requires little water and is drought tolerant. 2. Wooly Butterfly Bush – This shrub is hardy, requires NO additional fertilizer and grows dense. Its usual growth size is 5’ tall and 5’ wide and requires little maintenance. It prefers well drained soil and full sun exposure. An over watered Wooly Butterfly Bush will become limp and subject to rot. It has silvery foliage that is nicely contrasted by its bright orange flower groups which attract butterflies in the spring and summer providing additional excitement in your garden or landscape. An established Woolly Butterfly Bush should only be watered once a month in the winter and every two weeks in the summer. To reinvigorate the plant and maintain its shape you should prune it within a foot or two of the ground every two to three years. And excellent alternative to turf grass, ground cover plants are used to cover large barren areas of a lawn and add color and texture to your Phoenix landscape. They typically grow only a few inches from the ground. 3. Ice Plant – The Ice Plant makes for an excellent ground cover and can also be grown in containers. It prefers shade or partial shade, grows quickly and requires low to moderate watering. The gorgeous Ice Plant forms a dense mat of succulent green leaves and will produce stunning pink and purple blooms mid spring and summer. The Ice Plant does not tolerate foot traffic very well so be sure to plant it under your Blue Palo Verde tree or in a rock garden away from walkways. 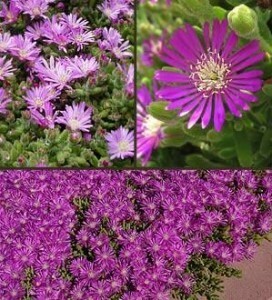 While the Ice Plant is growing and blooming it should be watered once every week or two. The plant becomes semi-dormant in the hot Phoenix Arizona summer months so reduce watering to every three weeks and always provide good soil drainage. Accent pieces for a Phoenix Arizona landscape are comprised of a variety of pieces ranging from cacti to succulents to ornamental grasses. Accents provide sculptural qualities and drama to your Phoenix Arizona landscape with a minimum amount of care. We recommend Deer Grass as it is the perfect accent piece for your Unique Landscapes, professionally designed and expertly installed pool or water feature. 4. Deer Grass – Deer Grass is dependable and fast growing. 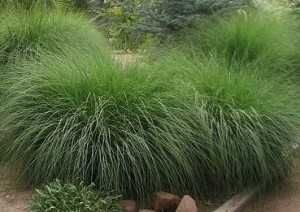 This ornamental grass is the perfect softening contrast to harsh cacti and boulders in your landscape. It thrives in full sun and harsh hot temperatures of Phoenix Arizona. It generally grows to a size of 4’ x 4’ and requires little watering. In the fall, Deer Grass produces tall slender flower spikes which create a stunning contrast to dense foliage. Although it is extremely drought tolerant, it will require adequate water in the summer months or its foliage will turn brown. Newly planted Deer Grass should be watered every three days for about a month and then you can reduce the watering to weekly through the first summer. You can further reduce the watering of established Deer Grass plants to every 2-3 weeks in summer and rely on rainfall in the winter.